These will quack you up! 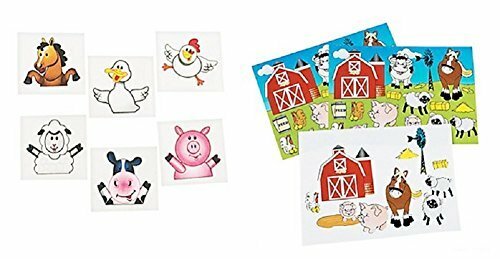 Our farm party tattoos are a must-have for a little country fun! Too chicken to try them? Not to worry, our tattoos are non-toxic, easy to apply and remove. So go ahead and have a little fun! Put a cow on your arm, a horse on your wrist...how about a pig on your ankle? 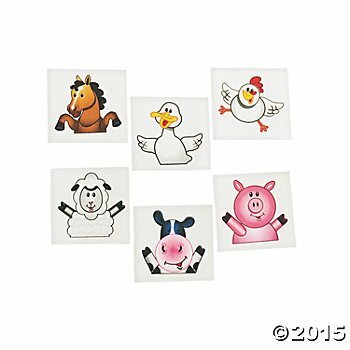 Don﻿'t be sheepish, just give these temporary tattoos a try! Includes 6 dozen so you﻿'ll have plenty to share with family and friends. 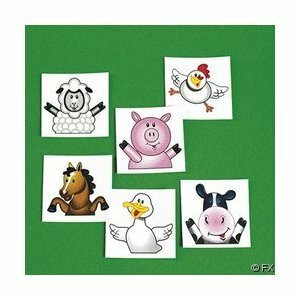 1 1/2"
This 96 Pc Farm Animal Party Favor Pack will be a hit at your next barnyard birthday party. 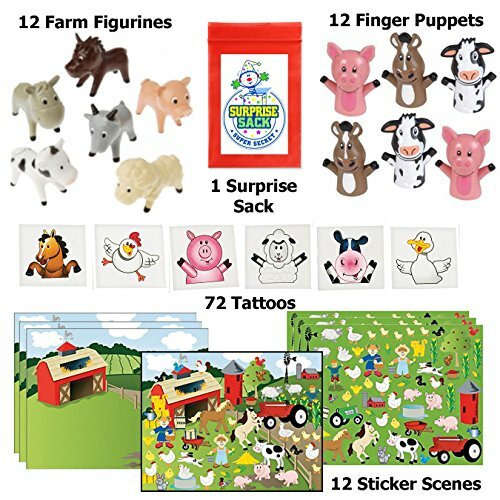 Featuring 72 cute farm animal tattoos, 12 farm sticker scenes to create, 12 Finger Puppets and 12 adorable barnyard figurines. 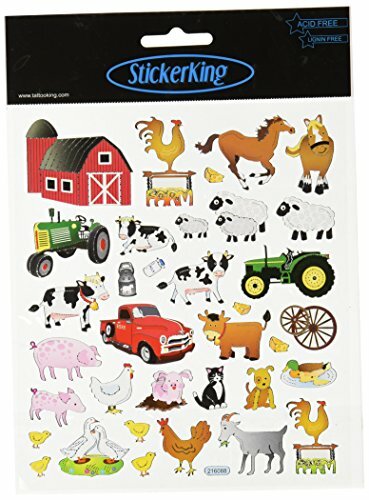 Farm Animal Party Set ~ 72 Farm Animal Tattoos ~ 12 Farm Sticker Sheets ~ New in sealed packages. 144 Farm animal tattoos, as pictured and described. 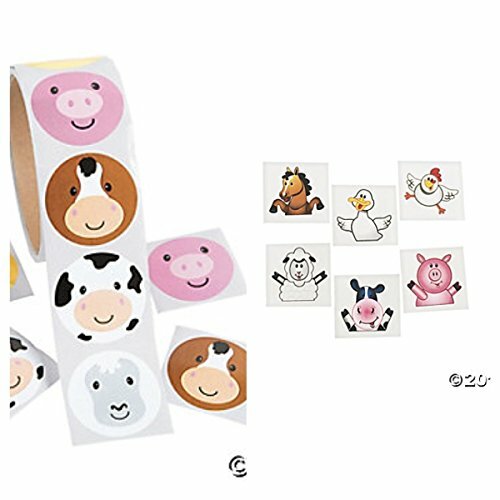 100 Farm Animal Face Stickers and 72 Farm animal tattoos, as pictured and described. 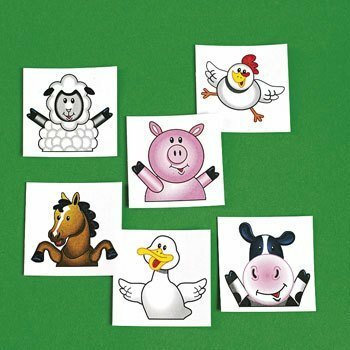 This Farm Animal Party Favor Pack will be a loved by all at your next barnyard birthday party. 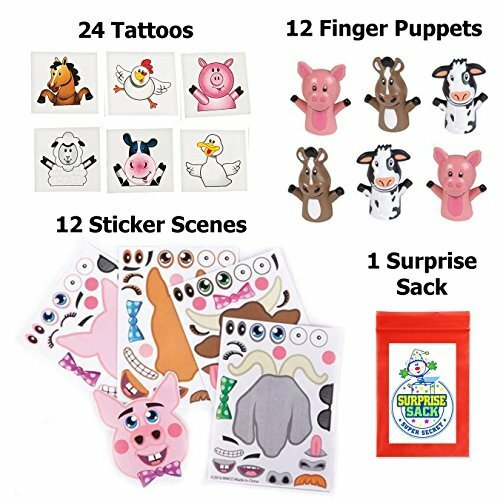 Featuring 24 cute farm animal tattoos, 12 make-a-farm animal sticker sheets, 12 Finger Puppets and 1 Super Secret Surprise Sack that contains a "farm" themed prize. Guaranteed to be a hit in toddler and preschooler goody bags! Also can be used as a stocking stuffer or as an Easter basket filler or stuffer instead of using so much candy.. Other great ideas for these novelty toys include: birthday party goody or loot bag fillers or party game door prizes for kids, school teacher class supplies, rewards or incentives for students treasure hunt or treasure chest items, school or church carnival, fishing booth or duck pond toys, Christmas stocking stuffers, Easter egg, Easter basket fillers or Halloween trick or treat giveaways, dentist or doctor prizes, end of the year thank you gift to each child in the class, toy gifts to include with their valentines cards or pinata fillers. 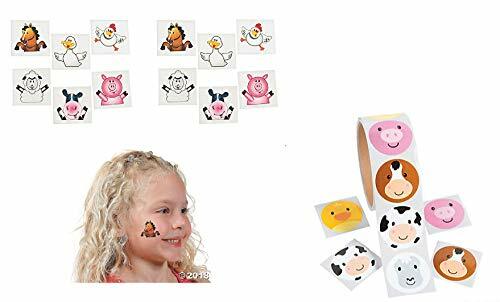 Great Toddler Party Favors or Toddler Travel Toys and Activities. Cucumbers, Hot Peppers, Cherry Tomatoes and an Eat Real Food Tattoo! These veggies pack a delightful punch! 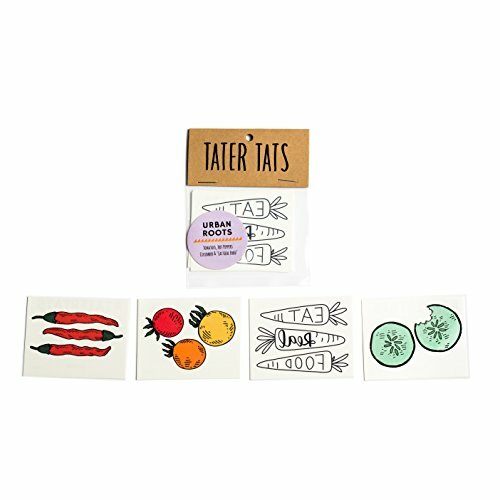 These tats were inspired by some urban farming friends and their beautiful summertime crops.10% of sales go directly to the Sustainable Farms. Pack includes Cucumbers, Cherry tomatoes, Hot Pepper and "Eat Real Food"